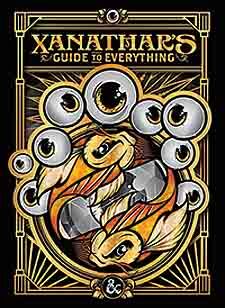 The beholder Xanathar - Waterdeep's most infamous crime lord—is known to hoard information on friend and foe alike. The beholder catalogues lore about adventurers and ponders methods to thwart them. Its twisted mind imagines that it can eventually record everything! Over twenty-five new subclasses for the character classes in the Player's Handbook, including the Cavalier for the fighter, the Circle of Dreams for the druid, the Horizon Walker for the ranger, the Inquisitive for the rogue, and many more. A variety of tools that provide Dungeon Masters fresh ways to use traps, magic items, downtime activities, and more - all designed to enhance a D&D campaign and push it in new directions.